Jim Valdes and Will Ostrom spend the day getting the mooring ready. 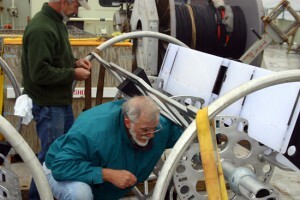 Here, they are loading a float into a SALP rosette. The SALPS are in place waiting for an eddy to pass by. 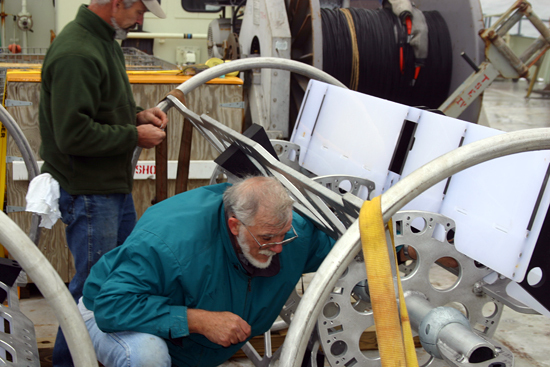 A float will be released each time the mooring instruments detect an eddy is close by. Meanwhile back in the lab the work continues. Every few hours Amy releases an XBT (expendable bathythermograph) device into the water. As we watch the computer after the device is released, a graph forms on the computer, charting the relationship between the depth and the temperature. 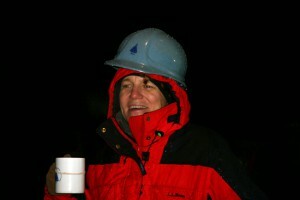 Amy hopes the temperature will rise as the depth increases, indicating the presence of an eddy. Amy spends hours at her computer examining data for salinity, temperature, and depth. She plans to deploy the one float left onboard tomorrow directly into an eddy.